How about a demon story to get you in the Holiday spirit? I mean what is better than a demon who is best friends with Santa and loves to drag children to hell? Feeling the Christmas spirit yet? 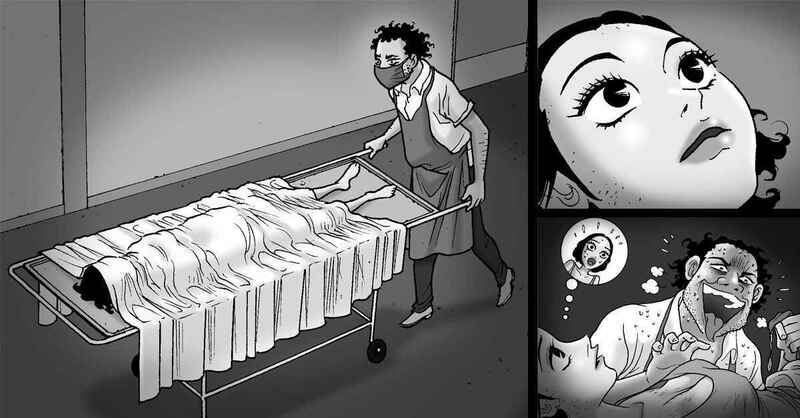 Who is this demon? Well, his name is Krampus and he apparently appears with a bundle of birch sticks and a basket to beat you with. But don’t worry since he will only beat you if you’ve been ‘bad’. And will only drag you to hell if you’ve been really bad! We can’t tell you if he really real or not. But we can tell you there is no Christmas creature more evil and terrifying than him. 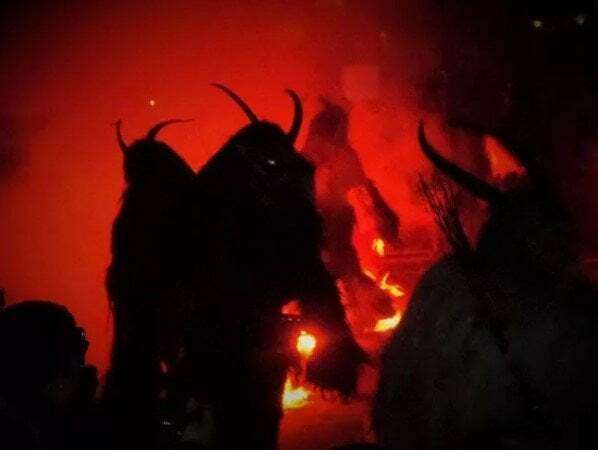 He likes to appear on the 5th of December as part of a horrific ritual when people dress up as Krampus and beat strangers. He is one of the most terrifying Christmas demon. He may be evil but he should not be mistaken for the devil. As he is half goat and half demon. Is there anything more scary? While his old pal Santa loves to bring a smile to children faces. Krampus is not so kind as he would rather bring them with him to eternal hell. 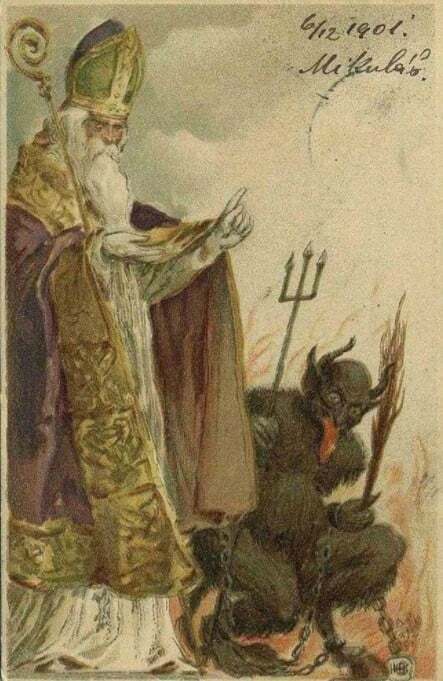 Santa and Krampus are actually good friends. I am not sure If i’ll like Santa after this but apparently they have been good friends since the start. 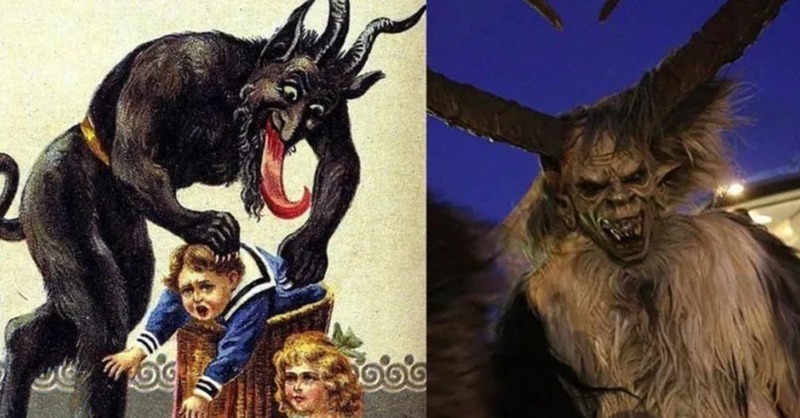 In the seventeenth century, Krampus and Santa would team up on Christmas. 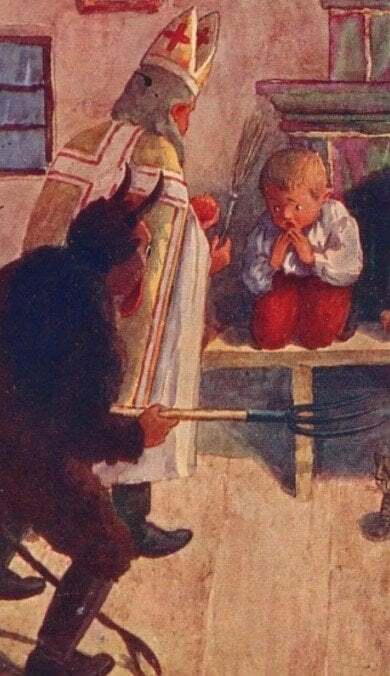 Krampus would scare the children with bodily harm and that would make the child straight as an arrow. Santa later swooping in to be the hero and showering the kid with gifts. So yes, rather than the bad kids not getting any gifts. They would get punished by the goat demon. Oh man, I can feel the Christmas spirit already! Krampus’s favorite weapon is his bundle of birch sticks. 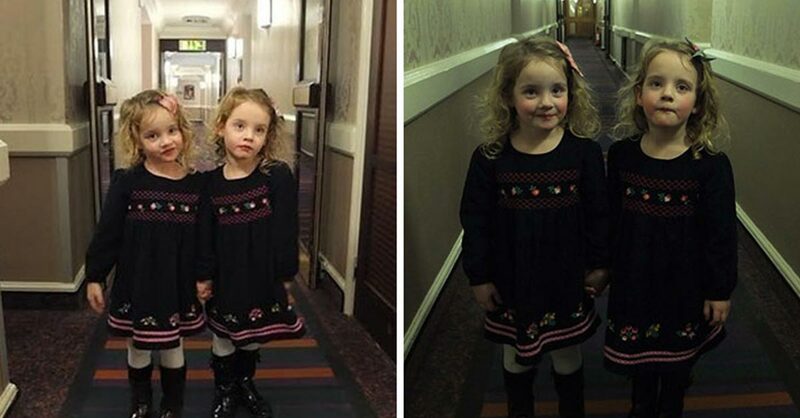 Making children behave is not an easy thing. 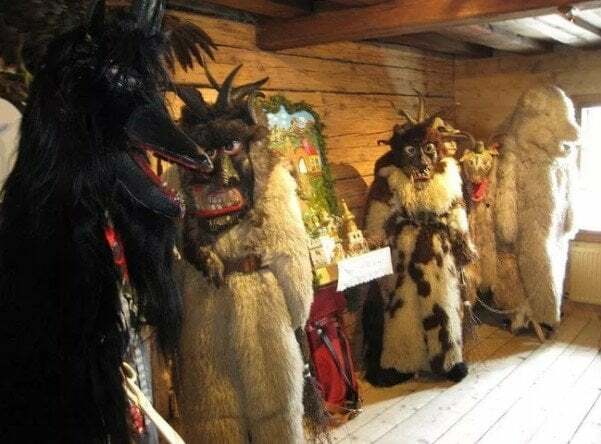 So that is why Krampus used a bundle of birch sticks to terrify little kids. He usually carried the bundle on his back and started swinging it whenever he saw a mis-behaved child. He was even kind enough to leave a bundle of birch sticks so the kid would be reminded everyday that Krampus was everywhere. You might see chains binding Krampus in many of the images. We are not sure but these chains might symbolize that he is bounded by the Catholic church and they can hold him or let him roam free. 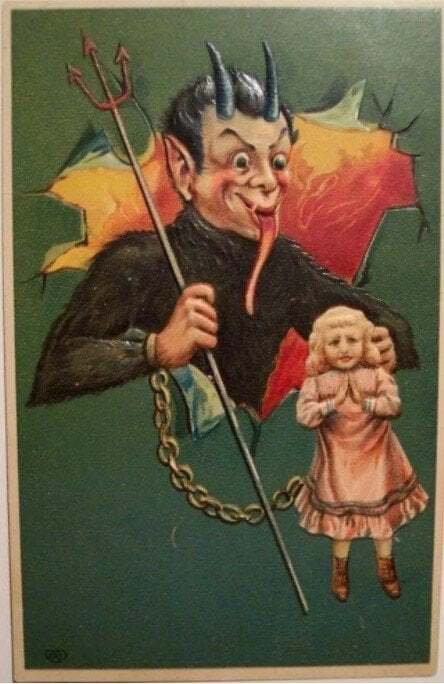 Krampus also like to swing these chains around as to show the children that they do not hold him. 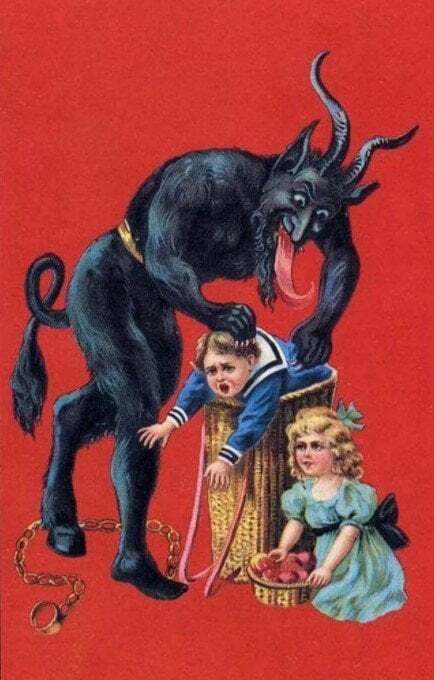 Krampus also brings a sack to stuff children in. His sack is usually for stuffing naughty children so he might drag this sack to hell. While many times, he likes to drown the child or even eat him. Whatever his choice, it is a far cry from Santa’s sack of presents. 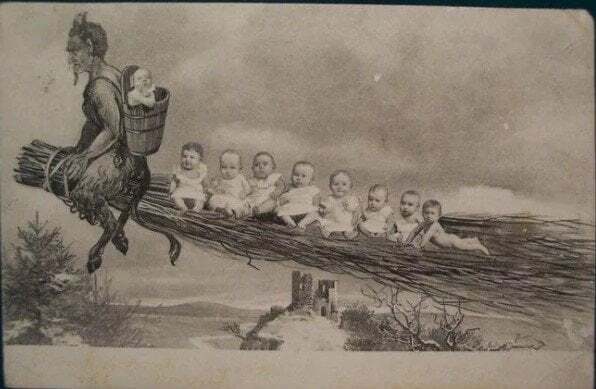 Krampus doesn’t even spare babies. While you might think that babies can’t really be that naught. That doesn’t seem to stop Krampus. As he can be seen dragging nine children to hell on his bundle of sticks that looks like a broom. So essentially, no one is safe from his wrath. 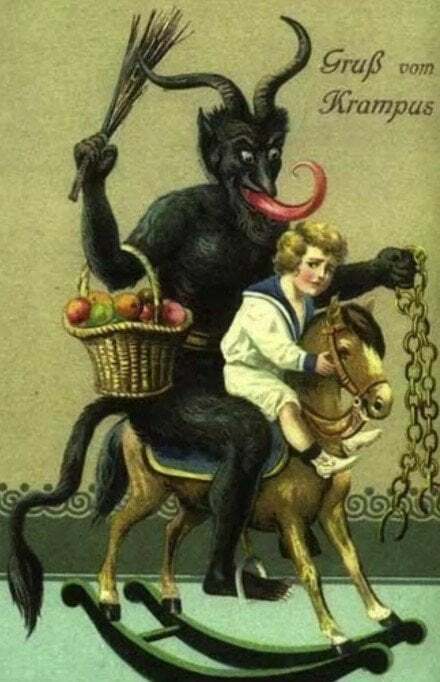 Krampus would visit on the 5th of December. 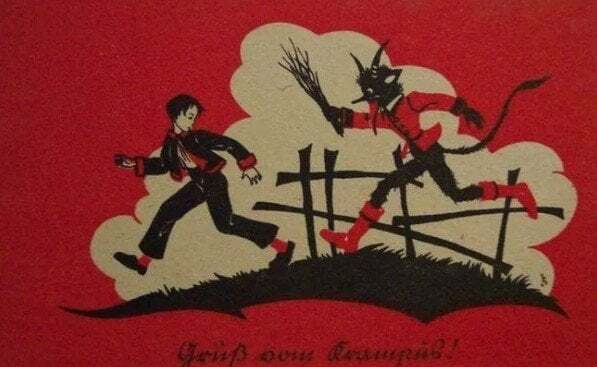 In traditional stories, Krampus would visit kids on 5th December to either leave a bundle of sticks or beat them himself. In special cases, he might even drag them back to hell with him. The next day however, the kids knew they could relax as they would get presents. 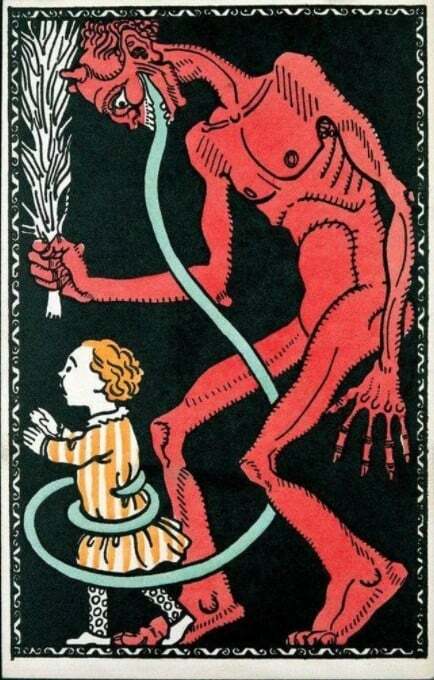 Parents tend to exploit Krampus. 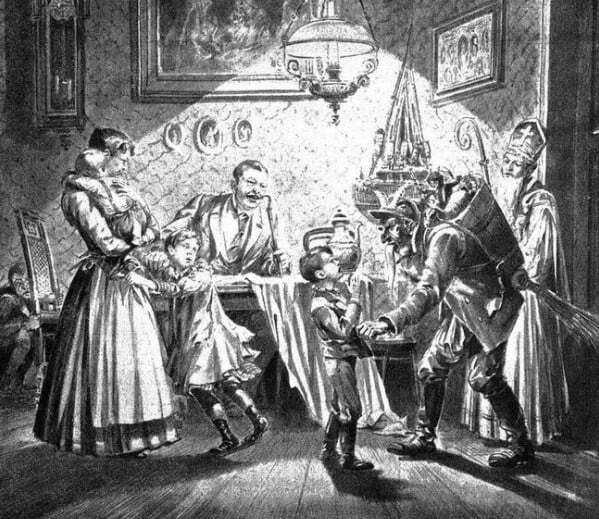 Parents used to make kids behave by telling them the story of Krampus. Sometimes even going as far as dressing up as him and threatening their children that they would drag them to hell. Not even good kids were perfectly safe from him. Even when the kid was a perfectly good fellow. Krampus would terrorize children whenever he wanted to not caring about whether it was the 5th of December or not. Krampus’s tongue might be the scariest thing about him, and that is saying something. You can clearly see in every image that his tongue is enormous. And it doesn’t even fit in his mouth. Some images even go as far as showing him grabbing a kid by his terrifying tongue. 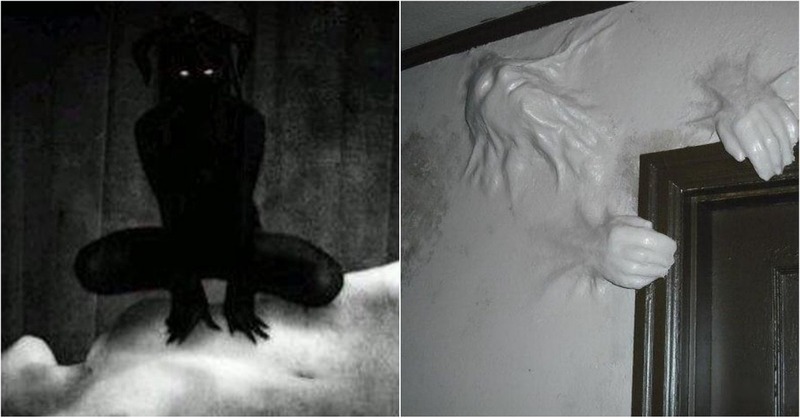 There are many more terrifying Christmas demons. While you may think Christmas isn’t the time for celebrating monster but that is exactly what many people do. 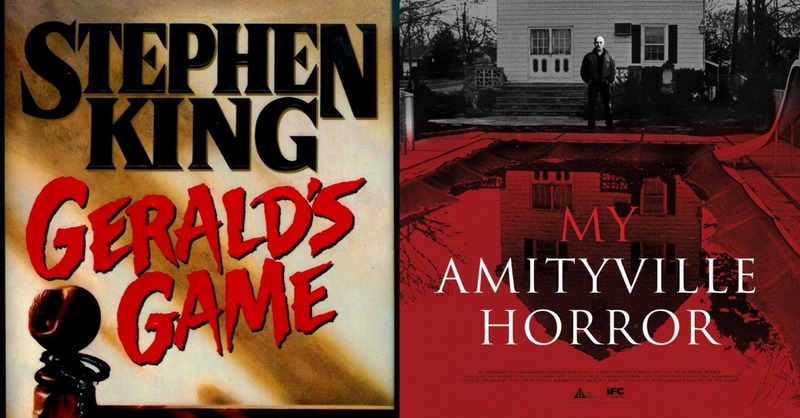 From Frau Perchta the witch who punishes kids to Hans Trapp who eats children, Christmas is filled with horrific stories of demons and monsters. Krampus has his roots in pagan tradition. The Catholic church did try to ban Krampus in the twelfth century but they were largely unsuccessful. 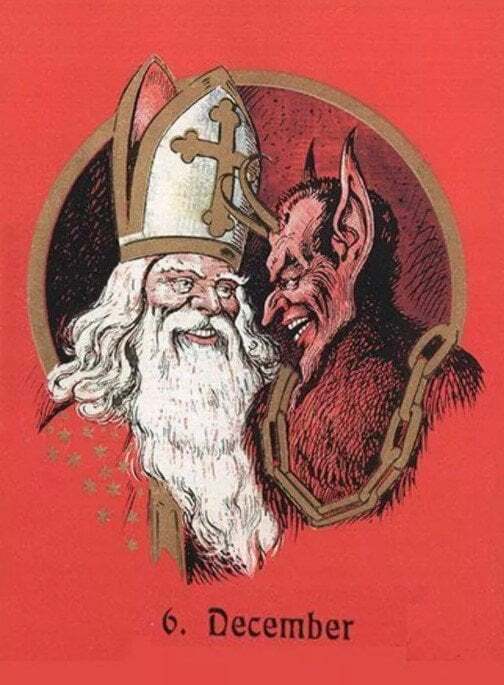 So after some times, they merged Christmas with pagan traditions and that is the friendship between St. Nicholas and Krampus was born. As mentioned before, Catholic church has tried to ban him several times but he keeps coming back. There was even a Krampus part in the U.S in 2015. This clearly shows that he might be catching on and you might have to look for this half goat and half demon this Christmas.